Levaillant's Cisticola ringed 4/07/2007, ring AE13576, retrapped several times. Yellow Bishop ringed 26/01/2007, ring BC99978, retrapped several times. 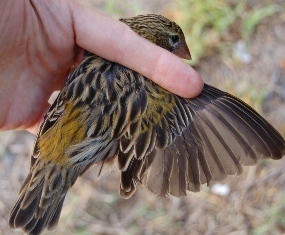 When first ringed this Yellow Bishop had an olive rump and shoulder (see photo 1) but now was in full breeding plumage (photo 2, Barry Schultz). 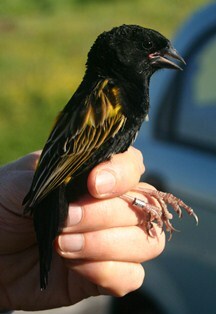 A local resident brought a dead weaver to the ringing session. It was found dead in a garden next to Little Princess Vlei earlier in the week. The bird (ring BE58352) was in virtually full breeding plumage - it had been ringed at Mocke River wetland as a chick, confirming that weaver males reach full breeding plumage by their second year. This is the most recent report-back of a chick ringed for a natal dispersal project .